An Introduction To DMR by Gena, M0EBP, from a blind person’s perspective! I hope you enjoy these recordings that I have put together after exploring DMR for a few weeks within early 2019. The GD-77S software is V1.1.10, Windows 10 and Jaws 2018.. Apologies for unwanted background noises during recording. As an introduction Gena describes the Radioddity GD-77S and more. Gena opens the software and creates a code plug with just one analog repeater keeping it simple to get started. Incomplete! Gena opens GB3PP using the GD-77S. Gena adds talk groups to the code plug. TG9 and TG 9999 for the OS2 and TG91 World Wide talk group. Not forgetting to unlink..
Gena struggles with the OS2 interface using the Chrome browser and Jaws. Hopefully it is clear that important settings should match in the modem and connectors sections of the interface. Remember to save after making changes. Gena takes a tour of the code plug and discusses Brandmeister and Phoenix servers and how 2 different numbering systems are linked for UK users. Minimal entries: GB3PP TG 91 WW TG 9999 Echo and TG 4000 Unlink. the UK Brandmeister talk-groups listed below. Unlink is on channel 1 of mode 2. GB3PP and GB3RF are 2 & 3 of mode 2 and are untested as yet. These are the 2 code plugs observed in this project. Having removed my ID. https://www.northerndmrcluster.com/talkgroups.html visit here if you want to view a collection of DMR Plus links i.e. 2350 linked to 4400. I am still learning about DMR and while I am glad to share my findings I cannot and do not suggest that my understanding is completely accurate. These are my findings as of February 2019. 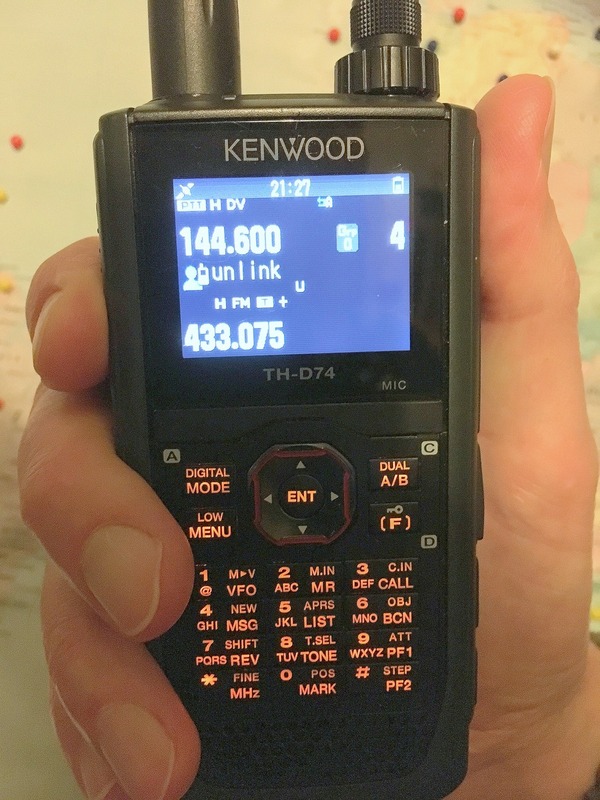 I was contacted by Jim MI0JPC in September 2016, asking if I had any accessibility information on the new Kenwood TH-D74 handheld. The model had been discussed on the Active Elements email group a few weeks earlier, but despite the radio’s obvious potential, no one had any firm details. The TH-D74 had the prospect of being the first handheld with full speech output and accessibility to D-Star. I have very limited experience of using handheld portable radios, and the low cost handheld I reviewed a few years ago only ’spoke’ the key that had just been pressed. It could not be interrogated further to learn the current frequency, and it left me feeling that only part of the accessibility job had been done. The Kenwood TH-D74 had the potential to be fully usable by a blind amateur, and the spec was impressive. It is a 2m and 70cm Dual Band handheld with full voice Guidance and D-Star. It has GPS, APRS, wide band coverage, including SSB on 2m and 70cms, and FM broadcast coverage. It would offer a plethora of programming possibilities, without a blind operator having to remember a set number of beeps or clicks. Basically, the radio sounded like an ideal unit to review for accessibility. I asked Mark M0DXR of Kenwood UK if he would loan me a unit, and I have to say a big thank you to Mark for sending me the review radio for a couple of weeks. To make sure I could get onto the D-Star system I was also loaned a Digital Voice Access Point DVAP by Jeremy G4JZL. Before receiving the radio, it seemed a good idea to prepare myself by grabbing the PDF manual from the Kenwood site. While 99.9% of the manual was easily read by using PC screen reading software, some buttons, such as the arrow keys, are shown graphically as pictures of arrows. When read with a screen reader, a picture is ignored. So, for example, when I read the PDF manual, I learnt that you turn on the power by pressing [ ]. OK, you can work this one out, but if the command involves presses of several buttons that include the arrow keys, and these are being ignored, you cannot learn how to operate the radio. I can fully appreciate the PDF manual will refer to a button as Menu, because Menu is written on the actual button. Likewise, if an arrow is printed on the real button, it makes perfect sense to show a picture of the arrow symbol in the manual. Sighted readers naturally expect this kind of consistency. When you consider the tremendous effort Kenwood have gone to in making this radio accessible for blind operators, it is such a shame the manual is so hard to use. It would be incredibly helpful if Kenwood would produce a separate text only manual. The graphics being ignored are a very small number, but nevertheless, crucial! To get over the immediate hurdle, I extracted the text from the PDF manual into a document, and Steve M6HFH went through it, replacing the blanks with text labels, such as ‘Right Arrow’ and ‘Power On/Off’. Jim MI0JPC has subsequently divided it into separate TXT files for easier navigation. Discussing this with blind amateurs on the Active Elements email group, folk indeed like using text manuals, particularly for the ability to rapidly navigate and search them. There is general agreement that both PDF and HTML documents work extremely well, if properly structured. I was able to rapidly establish that as a standard analogue multi-mode handheld the D74 has excellent accessibility, but the handheld also offered unparalleled access to D-Star. As primarily an HF operator, I only had a notional idea about D-Star, and I had found it easy to overlook. Having now used it, I’ve come to the conclusion that it is just another way of communicating, but with some great benefits. For one thing, you can talk and exchange greetings and ideas anywhere in the world, do so in audio comfort, and without the need for a large antenna system. This could be a great way of continuing with the hobby if you have severe antenna restrictions or even if you go into a residential home. Getting D-Star working is a great deal easier if you already know someone using it. Rob G0WSC has been using D-Star for a while, and was able to answer many of my questions. There is a fair amount of new terminology to learn and initially the plethora of connection methods is daunting. This is not just initially daunting for the blind amateur, but seemingly for many operators. Like many things in amateur radio though, the picture becomes much clearer and simpler the more you use it. As I’m a long way from a D-Star repeater, and very unlikely to be able to access one with a handheld, G0WSC suggested I use a Digital Voice Access Point or DVAP, and connect directly into the D-Star backbone. This means I could bypass the Repeater system. This inevitably means my review of using the D74 might well be different from your experience! A quick note about the DVAP. I was loaned a 2M DVAP by G4JZL for the period of the evaluation. The DVAP connects via USB to a computer, in my case a Windows PC, and the appropriate software is installed. The Th-D74 then transmits and receives on a simplex frequency, in DV mode, using the DVAP. The DVAP Windows software is not without accessibility issues. I found the setup screen did not give any feedback , using any of my screen readers. There is a second screen and you can switch to this with Alt+Tab. This screen can be read by screen readers and will show the setup screen, but you must switch back to the first screen to change the input parameters and switch back to the second screen to read any changes! The salvation of the DVAP software is that once setup is complete, no further changes are needed. I just ran the software, tabbed twice on the unreadable screen, and pressed Enter. The connection was opened. I could then switch to the second screen and get feedback if required. The only key combination I will mention here is how to turn on the Voice Guidance. Simply hold the Hash key when you power on the radio. If you haven’t listened to the audio tracks, you’ll still want to know if the radio is accessible. With some minor accessibility exceptions, the radio is brilliant. Not only does it give unparalleled feedback to the usual analogue operation, it includes full access to D-Star. I was unable to try APRS and the MCP programming software in the limited time I had the radio. I switched on the GPS function so I could use the Nearby Repeaters list, but I did not pursue further investigation of GPS features, beyond this. The review radio had version 1.0 of the firmware, and at the time of writing, version 1.04 is available. Future firmware updates hopefully also give the possibility of further accessibility improvements. Once again, Kenwood have approached accessibility very seriously for the blind operator, and done an impressive job. We have added a new section to the Kenwood TS-590 evaluation page, called ‘Assigning voice parameters to the PF buttons’. Andor PA9D describes how to use the 590’s Menu to assign each of the 3 available voices to the Programmable Function buttons, both on the radio front panel and microphone. The new section has a level 2 heading, for the convenience of screen reader users. It’s not often that one of the main amateur radio manufacturers launches a new flagship model. When Kenwood announced the TS-990S it naturally caused great interest, and I was intrigued to learn the radio would include an integral voice unit. Other recent Kenwood models can be fitted with the optional Voice Guidance and Storage unit, the VGS-1, and the built-in voice guidance might mean there was an improvement to accessibility, or might mean a reversion to former more basic functions. As you read on, you’ll see I was extremely impressed by the work done by Kenwood, and the TS-990S has made huge accessibility leaps forward! The TS-990S is a large 200 watt base station, allowing transmissions on HF and 6m. It has an integral ATU, and is mains powered. It has connections for 4 TX antennas and an RX antenna. I measured the size of the casing to be approximately 460mm wide, 160mm high, and 400mm deep, excluding front panel controls. The feet add about 40mm, making the actual height more like 200mm. This is an imposing radio! It is sadly inevitable that much that the TS-990S has to offer will be unused or unappreciated by a blind operator. The radio has large vibrant displays, and these caused quite a stir from several of my sighted friends. The TS-990S has many data decoding options and display graphics, and I spotted in the manual it can even be used for logging, using a USB keyboard. There are varied alternatives for getting audio into and out of the radio, and as well as Ethernet, USB and serial connectivity to a PC, both optical input and output is available, along with USB drive storage. Undoubtedly, one of the prime attractions of the TS-990S is the ability to have two independent cross band receivers. Anyone who seriously works DX, will immediately understand the advantages of listening simultaneously to the TX and RX frequencies of the DX station. I think that if you want to know more about the radio’s capabilities, you would be wise to read the full technical review by Peter Hart in the June 2013 RadCom. This is available in MP3 format in the Related Downloads section below. This evaluation is looking solely at accessibility, and how the TS-990S can be used by a blind operator. I am very grateful to Kenwood Electronics UK for the loan of the review radio. My first impression of the TS-990S was somewhat daunting! There are lots of controls, but it soon became apparent that Kenwood had brought all of the commonly daily used controls onto the front panel. Whilst initially overwhelming, it didn’t take long to realise I recognised every control, and they all made sense. This radio is geared up for quick and seamless operating, and while there is undoubtedly a learning curve, you won’t be digging into the menus just to increase the power. As previously mentioned, there are two displays. The largest is positioned on the left at the top of the front panel, the smaller is approximately in the centre top with the main tuning VFO below, and the right third of the front panel is given over to button and rotary controls. All of the buttons are a hard flat plastic, meaning there is no unpleasant dragging on the finger tips as you feel for a control, and the buttons are flat and without lumps and bumps. There are many different shapes and sizes of button, and it will take some time to become fully accustomed to their layout. In fact, I think the manual will almost certainly become your best friend, for a while at least! In slightly more detail, there are buttons in a vertical column at the far left of the facia, and to the left of the large display. These include The power on, Timer, Programmable Function A, Send, and Auto ATU. There are 7 function keys running along the bottom edge of the main display, and a series of rotary knobs below the function keys. These are typical concentric inner and outer rotary knobs, and control Mic and VOX Gain, Processor levels, TX power levels, Key speed and Delay, and CW pitch and Monitor level. Just above and in-between these knobs are 4 further buttons related to the function of the knobs themselves. A vertical column of 7 buttons is positioned between the displays, and they include control of Antenna selection, Pre- amp, TX power limits, the display Meter, and TX filter. Below this column are the vertically arranged Mode buttons announced with CW, and to their right, the main tuning knob. To the right of the smaller display and Main tuning dial, at the top, is the numeric keypad, with markings on the 5. This has 3 buttons above including RX antenna selection, and transverter, and the Menu button is in the row below the keypad. Below this is the main block of buttons. These include Main and Sub band selection, with Up and Down buttons in a group. A group of 9 buttons operate the Memory system, RX record and play back, and Quick Memory. There are 6 buttons in 2 groups of three, positioned above and either side of the main tuning knob, controlling the use of the two receivers and the Split function. There is a column of buttons to the right of the main VFO for Fine tuning adjustment, Main Voice, and main Lock. Continuing to the right along the bottom of the front panel is the smaller Sub tuning dial, and the Fine, Voice, and Lock are mirrored for the Sub receiver. Moving to the top of the facia and to the right of the keypad is the RIT adjustment knob, with related buttons below. Below this is the Multi-Ch control, with 2 columns of 3 buttons below, for Diversity reception, PF B, AGC, and RX and TX Equaliser. It is nice to find the equaliser controls have found a place on the front panel. Below these buttons is the previously described Sub tuning VFO. Back at the top and to the right of the RIT, are inner and outer rotary controls for Noise Blanker 1 and 2, and then Noise Reduction 1 and 2 in the top right corner. These are turned on with buttons below each knob. Below these, and to the right of the Multi-Ch control are inner and outer rotary controls for Main Notch and Squelch, and Sub Notch and Squelch. Below these controls are buttons to control the Notch behaviour on each receiver. Below the Main Notch knob is the band pass control. a rotary concentric inner and outer knob allow the band width to be changed. To the right of the band pass control are 8 further buttons to control the AGC, Noise Blanker 1 and 2, Noise Reduction 1 and 2, and APH, for the sub receiver. Finally, the bottom right corner has separate concentric inner and outer controls for main and sub AF and RF gain. For a comprehensive front panel layout, see below in the Related Downloads section. A note on the layout. Make no mistake, this is a complex radio! There is a large block of buttons extending below the keypad, and my sighted friends initially expressed some concerns that none of the button groups lined up with their neighbours. In reality I’ve not found this a problem, but the button area is busy. I think that having a varied tactile layout can aid navigation, and as I’ve become accustomed to how everything fits together, I’ve found the different shapes and positions actually helps me find the needed control. The manual is currently available in PDF format, and I found it quite easy to use with the Window-Eyes screen reader, and it is essential reading to understand the TS-990S operation. As a blind user, you will certainly also need a full front panel description in the learning stages. One small criticism about the numeric keypad, I personally don’t feel there is enough space around it for rapid tactile use. There is a row of 3 keys directly above and below the keypad, and only the slightest increased separation between them. I can’t help feeling that over the course of the radio’s life, a blind user will potentially use the keypad thousands of times and very swift operation is only possible once the first button press has been verified as correct. Saying that, the keypad is fully voiced, which is a tremendous asset. The TS-990 has the integral automatic announcement voice guidance switched off by default. As a blind user, you will want to turn it on. This can be done through the menu system, but the easiest method is to hold the PF A button when the radio is switched on. Kenwood have been able to loan me the radio for just over a week, and I will be the first to admit the rich feature set of the TS-990 will need much longer to investigate fully. I discover something new in terms of accessibility every time I switch on the radio, and you will understand why as you read on. Traditionally, amateur radios have been made accessible by announcing button presses, and announcing the result of any changes. The TS-990S does not slavishly follow this convention, but has taken huge strides in accessibility by giving spoken announcements to the changes being made on the displays through the Function keys. This means that even the very advanced options, such as recording audio messages, can be easily managed by interacting directly with the display a sighted operator uses! I normally write about the great Kenwood accessibility to the menu and memory systems, and all of this is spoken as we have come to expect from Kenwood, but we are not used to having such accessibility to the more advanced functions of high end radios. The TS-990S, in my opinion, has moved the game forward in leaps and bounds. It seems to me that the traditional menu system is now more reserved for adjusting little used settings, the kind of options you set and forget. All of the more commonly used features have either been given their own control on the front panel, or are adjusted on the main display using the Function buttons running along the bottom of the display. I believe it is this accessibility to using the Function Keys that really sets the TS-990S apart. Once I had started the automatic announcement of the Voice Guidance, by switching on with the PF A key held, I decided to install the Kenwood ARCP software on my PC. This is free from the Kenwood site, and it immediately gave me access to the menu system via the PC, using my screen reader. The Menu is accessible using just the radio, but only the menu numbers are spoken, and you will need an external list of the menu structure to browse through it successfully. The big advantage of using the ARCP software is that it is accessible, and each menu option is described. I’ve not actually spent much time investigating the software, but the pulldown menus seem to work well, and it seems to me this is certainly an easy way to make Menu changes. Any changes made using the ARCP are immediately seen on the radio, and similarly, any changes made to the menu on the radio were immediately seen on the PC. Using the software, the Menu is shown as a Tree-View, and each group is then opened to show the options. When you want to make a parameter change, just tab through the Checkboxes. If you use the rig to make menu changes, just press the Menu button, move through the options with the Multi-Ch control, and press F4 to select. The use of the F4 function key, as the selection button, was my introduction to using the function keys. As is my preference, I was able to set the Multi-Ch control to 1kHz steps for each rotary click, and the frequency is moved to the round figure. This means I can tune for a signal, and providing it is on a round frequency such as 7.106.00, I can make the final tweak with the Multi-CH control. I also like the VFO to move by 5kHz for every complete revolution of the main VFO, and this was easy to set. When the Fine frequency button was engaged, each revolution then moved by 500 Hertz, meaning I would move from 7.100.00 to 7.100.50. I was also very pleased to see the frequency was announced to the Hertz level with the Fine adjustment engaged. The frequency is announced as 7.100.500. Over the course of the evaluation I found that visits to the Menu were very infrequent. As I’ve previously mentioned, all of the common functions of the radio are controlled from the front panel. I found that when I needed an announcement I got one, and when the voice would have been obtrusive, I got useful beeps. I guess the Antenna change button and the Attenuator buttons sum up this approach. These buttons are in the column between the displays. Press the top button for aerial selection, and you hear ‘Antenna 2’. Subsequent presses give ‘Antenna 3’ and so on. Move down to the Attenuator button and you hear one high pitched beep for 6dB, two beeps for 12dB, three beeps for 18dB, and a single lower tone for off. Holding the button takes you in the reverse direction. The third button in the column is the Preselect. This button Beeps for on and off with a momentary press, and when held it announces the setting, and can be adjusted with the Multi-Ch control or the function keys. F1 held, will reset back to default. The fifth button in the column, the TX Power Limit button, allows you to set power limits on each band, and between data, non data, and Tune. The TS-990S has many options for assigning programmable function buttons. There are two dedicated buttons on the front panel, labelled PF A and PF B. By default, the PF A key announces incoming signal strength, or outgoing power when sending RF. PF B works in conjunction with the Meter button, and can announce Power and SWR when transmitting. The Up and Down buttons on the microphone can also be assigned as PF keys, and an external unit can be constructed for eight additional PF keys. The optional MC-47 fist microphone has 4 extra buttons available for programming, and I calculate this would give the dizzying possibility of 18 programmable keys. As so many functions can be assigned to a PF key, this gives lots of options to move commonly used keys to somewhere more easily accessed. Traditionally, the frequency announcement itself has been assigned to one of the available PF keys, but the TS-990S has two dedicated Voice buttons for both the Main and Sub receivers, so the PF keys are not needed for frequency announcement. Continuing with our look at the vertical column of buttons between the displays, the sixth button, the Meter selection, is a pleasure to use. Among the options, the SWR, ALC, and Power are announced by transmitting RF and simultaneously pressing the PF B button. On the Meter screen, Processor is only announced if the Processor is enabled. I found the lower left row of rotary controls very easy to use, as although there is no voice announcement on the majority of them, the notch in the control can be felt. If we look at the first knob, the inner is the Mic Gain, and the outer the VOX Gain. Using the adjacent button gives access to the VOX Delay and Anti Vox setup on the display. Changes are made with the function keys. Split operation is very slick, with a dual watch function allowing the Main and Sub RX to be separated into left and right ear pieces. I needed to enter the menu to set the 50/50 balance for the headphones. All of the Main and Sub functions work very well, and Split operation is clearly announced. A momentary press of the Split key announces ‘Split On’. Holding the Split key announces ‘Split Enter’. If you then press a 5 on the keypad, the Sub receiver is instantly set 5kHz higher. If the Main is set to 7.100, you hear ‘Split TX 7.105’. As we have come to expect with Kenwood radios, the memory system is accessible. As well as storing Simplex frequencies, using the F6 key when storing, Will allow the Sub band to be included. When subsequently scrolling through the memory channels, the duplex channels are announced with a ‘D’, and simplex channels with ‘S’. The TS-990S has 6 channels to record voice messages. The messages are controlled using the function keys, running along the bottom of the main screen. Again, these buttons give enough spoken feedback for operation without sight. To record a voice message press F2, you will hear ‘Voice Message’. Press and hold F2 through F7, which corresponds to message channel 1 through 6. If you press and hold F2 for message channel 1, you will hear ‘Record Mic’. At this point you can change the input source, but the default is mic. Press and hold F4 and make your recording. If you press F2, your message is played back. Setting the CTCSS tone is a good example of the TS-990S accessibility for lesser used features. Firstly, change the mode to FM, and press and hold F4. You will hear ‘Main Tone 88.5’. Next press F6 to select the Main or Sub band. You will hear ‘Main’. F6 now toggles between Main and Sub. Use F2 and F3 to switch between Tone and CTCSS, and use F4 and F5 or the Multi-Ch knob to move between the frequencies. Press Escape when you’re done, and remember that holding F1 resets back to the default. Recording communication audio. You can record a maximum of 30 seconds of audio data per file to internal memory or a maximum of 9 hours of audio to a USB thumb drive. I found the Record, Stop, and Play buttons allowed me to capture received audio, and replay it instantly. Pressing F1 announced ‘Audio file’, and I was able to move through each of the previously recorded clips and play them. AGC. The AGC buttons are available for both the Main and Sub receivers. There are full announcements for Fast, Medium, and Slow, along with their values. Holding the AGC button enters the AGC setup, and the values are easily adjusted and saved. I’ve mentioned the memory channel system is fully accessible, and the quick memories work well too. Interestingly, pressing Enter, and then rotating the Multi-Ch control, takes you through the history of frequencies entered through the keypad. A very nice touch, and again all announced. Briefly, I found the Timer functions were announced, and while I did not complete the setup, programming the clock and setting a sleep timer all looked to be accessible. There is a Lock key for each receiver, and similarly two Mute buttons. Very usefully, I found the radio would announce its status at switch on, if it had been left in setup mode, or in Split mode, when it was switched off. In summary, I am incredibly impressed with the accessibility built into the TS-990S. It seems the voice announcements allow the operator to make almost any change, as a sighted user would. I installed the ARCP software and this meant I could browse the menu system with descriptions, but whilst useful, it is not strictly necessary, as the menu plays a more minor role in this radio. Having the radio for just a week meant there is much more to discover, and no doubt much better ways of doing things, but I’m sure the audio demonstrations will give you a good idea of the tremendous work that has gone into making this radio fully accessible. Congratulations to Kenwood, for a flagship radio with truly superb accessibility! This article is © of the Radio Society of Great Britain (RSGB) and was originally published in their magazine, RadCom, 06 2013. It is reproduced here with their kind permission. For more information about the RSGB please visit http://www.rsgb.org. The Kenwood TM-V71E is a mobile VHF and UHF transceiver for FM communication. There is not a terrific choice available for a blind amateur in this market with accessibility, and if you want a multi-mode radio, your best bet is probably one of the so called ‘shack in a box’ transceivers that also covers HF. The TM-V71E has been around for several years, and is considered to be near or at the top of the shopping list for blind amateurs wanting a 2m and 70cm FM radio. Although generally accepted as one of the most accessible radios in this market, I thought it would be worth evaluating the TM-V71E, and I thought it was useful to jot down some of my findings. I don’t intend to write a full review, and I am delighted that there are so many accessible resources available to get you started. Under the Related Documents section on this page are an MP3 review and demo by David 2M0TSR, the full manual recorded in MP3, and the full manual in HTML format. Each describes the layout and operation, and I would encourage any owner to check them out. I have evaluated the TM-V71E, and this is the European version. I believe the other versions are very similar in operation, but with frequency allocations more appropriate to their region. As I am almost entirely an HF operator, I was initially surprised by the small size of the TM-V71E! I’ve approximately measured the width to be 140mm, the depth 190mm plus front controls, and the height about 40mm. The radio has one N type antenna socket, computer and TNC sockets, and will support two external speakers, one for each VFO. It transmits on 2m and 70cm, and has three power levels. Low is 5 watts, Medium is 10 watts, and High is 50 watts. There is no numeric keypad on the front panel, but the chunky microphone has a keypad, and 4 additional programmable buttons. The radio can also be used to receive frequencies outside of the amateur bands in FM and AM modes. The front panel controls are very well defined, and the buttons are a hard plastic giving no finger drag as you move from control to control. There is a small tuning knob at the bottom left of the facia, And this clicks as you tune through the frequency steps. This knob is also used for selecting memory channels and moving through the Menu. The bottom right has two Volume and Squelch knobs, for independent VFO a and VFO B control. These knobs and the Tuning knob can also be pressed for additional functions. The test radio was fitted with the optional VGS-1 voice guide. This gives spoken access to the majority of button presses, but I must stress that there is still a need to read and understand the operating guide, as the radio is surprisingly complex in use, and there are several potential pitfalls just waiting to trap the casual blind operator . The Memories are spoken, giving accessibility to the storage of repeater programming, and the Menu system can be navigated with speech output. In line with other Kenwood radios I have tested, the Menu channels are not fully described as you move from item to item, and it is necessary to have an external reference list at hand. Menu access is achieved by pressing the Function key followed by the Tuning knob. You are given the spoken prompt ‘Menu 001’, and further turns of the Tuning knob click through to ‘Menu 002’ and so on. As you move through the menu, the selected parameters are not automatically spoken for each menu. I found I had to press the Tuning knob to be placed into a talking list of the parameters. A further press of the Tuning knob saved the setting, and returned me to the menu list. Using the microphone keypad, it is very straightforward to enter a direct frequency, but first, one of the Programmable Function (PF) buttons must be designated as Enter. I found that it was ideal to use one of the four PF buttons on the mic for this purpose, and menus 509 to 512 can be used to set these buttons. I found the PF keys seem to be programmed in the reverse order to my expectation. For example, 512 is the top PF button on the mike, and 509 is the bottom button. The tone key cycles through Tone, CTCSS, or DCS, and Off. These functions are not initially spoken, and each setting has the same higher pitched beep, with the Off position having a lower beep. I also found that when on the CTCss and DCS positions, the radio usefully became silent, as only signals with the appropriate coding are allowed through. I guess this might cause some head scratching if the tone button is pressed accidentally. If I needed to set the CTCSS, I pressed the Tone button until I heard the lower pitched beep of the Off position, pressed a further two times, and pressed function. Now, a further press of the Tone button would speak ‘CTCSS frequency 88.5’. The tuning knob is then used to make the selection, and a further press of the Tone button saved the setting. In its simplest operation, I found the Rev key worked by switching the input and output frequencies when listening to a repeater. I briefly investigated the more advanced Rev functions, and I could change the plus or minus offset frequency. Pressing Function followed by Rev toggled the settings between Off, minus, and plus. The Off position, where there is no offset, gave a low pitched tone, and plus and minus gave a higher pitched tone. At each stage I pressed VFO A volume control to read the frequency, in conjunction with the Rev key, to find out what I had changed. There is plenty of scope for confusion using this function, and I suspect there will seldom be a need to use it beyond initial setup, and possibly never. Here in the UK, the 2m repeater outputs are in the frequency range 145.600 to 145.800. I found that entering a frequency in the repeater block automatically set the correct offset for the transmit. It is then just a matter of selecting the right CTCSS tone and saving to memory. As we have come to expect from Kenwood, the memory channels are fully accessible. The channel numbers are spoken and their status is announced. If you have lots of repeaters in your area, it would be useful to maintain a list of frequencies and the memory channels used. There is a facility to label memory channels, and while the actual labelling process was inaccessible, I did add one label, with sighted help, to see what happened. Unfortunately, only the channel and frequency were spoken, the tag was ignored. Since I started to evaluate the radio, I was intrigued by the voice announcing ‘PM2’ at the power on. Investigating further, the radio has 5 Programmable Memory states. This allows a single user to setup the radio for several types of operating or for use in different localities. It also means that several different users can tailor the functions to their particular preference, and store the individual setup. This system is again accessible, but I think could cause a degree of confusion if the wrong buttons are pressed. Imagine setting up the PF keys on the microphone in PM1, and then accidentally moving to PM2. All the settings still reside in PM1, but appear to be lost. With this scenario in mind, the way of changing the PM status is as follows. Simply press the PM button until ‘PM’ is heard, and then press one of the keys running along the bottom of the front panel. The Call key turns PM mode off, the Function key moves you to PM1, the tone key to PM2, and so on. The memo and conversation functions of the VGS-1 work as described in the manual, and can be easily used. Unfortunately, I could find no way of having the VGS-1 tell me the incoming signal strength. Overall the Kenwood TM-V71E is highly accessible, but there are still some areas where the blind operator has to infer the information, rather than being told it explicitly. I am personally surprised at the complexity and rich feature set of this small VHF and UHF radio, and it is certainly a unit where the manual needs to be read thoroughly. Once again, Kenwood have worked extremely hard to make the TM-V71E very accessible through the VGS-1 voice guidance system. 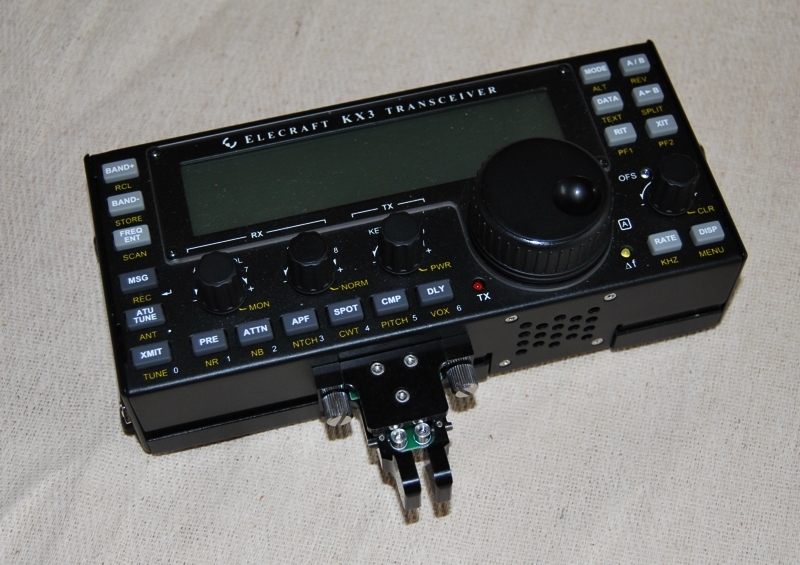 The KX3 Is the first Elecraft radio I have tried. Several of my amateur friends have been using Elecrafts for several years, and the brand certainly seems to engender a loyal following! 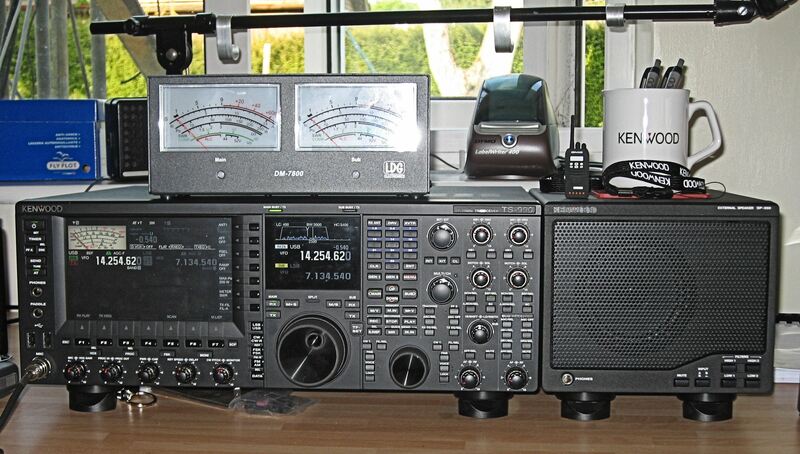 I have had the opportunity to borrow a KX3, serial number 1907, while my friend G4JZL has gone on holiday. Reading comments from others on the Active Elements email group, I count myself very privileged to have been entrusted with such a prized possession! The KX3 in this evaluation used firmware version 1.1.2, a very early firmware version. The very latest Beta firmware in early May 2013 is 1.4.7, and Rob K6DQ has tried out some of my findings with version 1.4.4. Rob describes the firmware progress as being akin to having a new radio every few weeks, and it is interesting to note the improvements already made to the CW readout in recent upgrades. I have only spent a few hours with the accessibility documentation, and I feel I only understand the basic operation. Due to the rapid development of the KX3 firmware It is very likely that the findings in this review will have changed again, or I have overlooked something obvious! 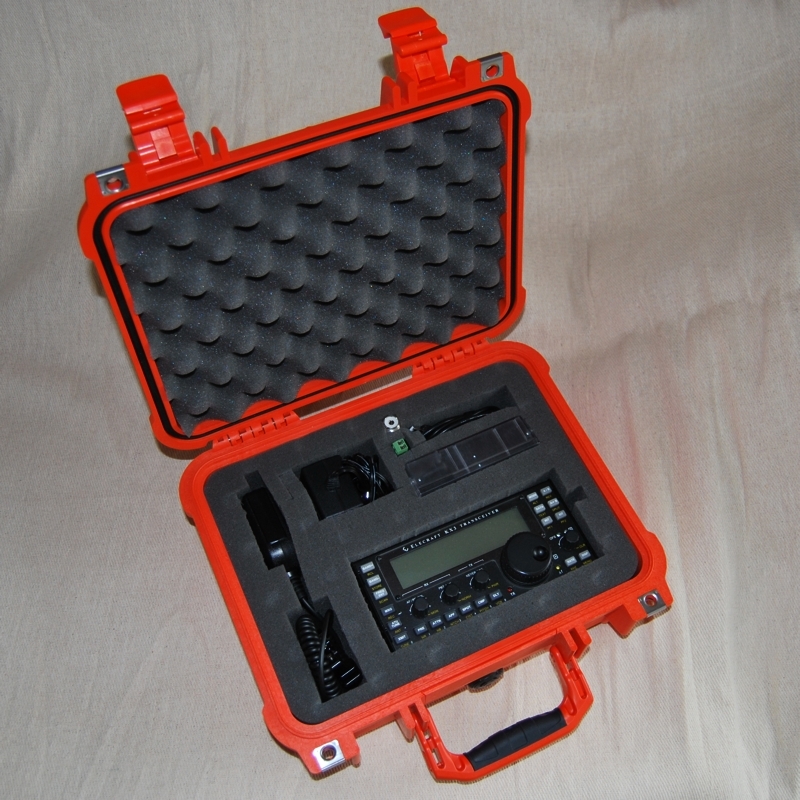 The KX3 is an HF radio covering from 160m to 6m. The power output is up to 10 watts from an external power source, and it has an internal battery and an internal auto ATU capable of matching a 20 to 1 SWR. There are many optional extras such as the 100 watt amplifier and the narrower roofing filters, and the microphone is itself an additional option. While primarily a portable radio, the KX3 has base station receiver performance in several areas. The April 2013 RadCom review by Peter Hart was very favourable, and on paper some of the figures were comparable with the very best. It is perhaps too easy to categorise the KX3 as a CW only portable radio, but I can confirm it sounds excellent on SSB transmit, and I found during my testing that the noise reduction on SSB reception is superb. Listening with the KX3 to a weak DX station on a noisy frequency, the Noise Reduction excelled at reducing the fatigue of listening to a weak signal through the crackles and hiss of HF. My initial impressions of the KX3 was that it was a shape and size unlike anything else I have used before. It is about 200mm wide, 100mm deep, and 90mm high including controls. I can best describe it as being in the shape of a house brick, with the controls on the top surface. The KX3 has a BNC aerial socket on the right side, and power input and sockets for microphone, Morse key, headphones and PC connection on the left side. There are future plans for an additional 2m antenna connection, and you are given the impression the KX3 is very much at the start of the development cycle. As the KX3 is offered as a kit, I speculate that some of the hardware improvements, such as the 2m VHF capabilities, might be offered as a module for existing radios. I will describe the top panel as though you are looking down on it from above, in a plan view. There are 6 buttons on the far left, running from top to bottom. These include the up and down band buttons, the direct frequency initiation, and the auto ATU. The bottom button is the zero in the numeric keypad. 6 more buttons run along the bottom of the panel, starting in the bottom left corner next to the zero button, and ending about two thirds of the way along the facia. These buttons control receiver functions such as Pre-Amp, Attenuation, Noise Reduction etc. These buttons toggle settings on and off with a momentary tap, and toggle other settings with a longer press. An abbreviated CW announcement is given for every press. The pitch of the CW changes as commands are switched on and off. These buttons also act as 1 through 6 in the numeric keypad. Above these buttons are 3 rotary knobs. As well as turning, these knobs can also be momentarily pressed or held. Often a function is entered by pressing a knob, and the adjustment is made by turning the same knob. Again, you are given adequate CW feedback at each stage. These knobs also act as 7 through 9 when used for frequency input. Meaning the output power is set at 4.6 watts. When in SSB mode, the second knob can be used to control band pass filtering. Tapping the knob switches between High and Low cut, and rotating the knob changes the filter width. A longer press puts the filtering back to normal. You are given CW feedback for High, Low and Normal positions. Above these 3 knobs and virtually in the top centre of the facia is the LCD display. The main VFO tuning knob is to the right of the third knob described previously, about three quarters of the distance from the left edge, and finally to the right is the Sub Band tuning knob. This smaller tuning knob is also used for RIT and XIT tuning, and for scrolling through the menu. There are 6 buttons in two columns of three at the top right of the panel. These buttons change the Mode, and control the swapping of frequencies between the Main and Sub VFOs and the Split functions. The bottom two buttons of this block are programmable, and can be assigned to menu options. Finally, there are a further two buttons at the bottom right for changing tuning step size and for announcing frequency in CW. The bottom right button also accesses the configuration menu when held, And when not used for CW frequency readout is used for switching the VFO B area of the LCD display to show various parameters, such as power supply voltage, battery voltage, current draw temperatures and other non accessible info. It is worth mentioning here that the HamPod reads all of this information, and this is discussed later. In terms of usability by a blind op, it is very interesting to discover how Elecraft have put considerable thought into accessibility. The radio can be setup to produce CW feedback for almost all of the controls. This means the KX3 is highly accessible if you read CW. The CW announcements are turned on in the menu system, and it would be nice if this was an option assigned to one of the programmable buttons as a default. It would mean a blind customer could purchase the KX3, turn on the announcements independently, and start using it without sighted assistance. Although the menu system gives no aural feedback at this stage, the accessibility documentation indicates that Elecraft plan to give CW access to the menu system in future firmware upgrades. I think that one of the most exciting aspects of this KX3 review is the discovery of the accessibility documentation prepared by Elecraft. The document is specifically written for blind operators, and describes the radio controls. You are encouraged to read the full manual for more in depth information, but the accessibility documentation covers the basic operation of each control. One improvement that could be made to the accessibility documentation is to give each control a structured number. For example, I added A-1, A-2, etc to each of the 6 buttons on the left side. The 6 buttons along the bottom edge became B-1, B-2, etc. Without this additional indexing, it is unnecessarily difficult to search the file, to find the purpose of one control. Similarly, by assigning each control an individual reference number, I can search for ‘Split’, and instantly see it is button C2. There is a copy of the accessibility document at the foot of this page, and I would imagine it will be updated as new features become available. I would therefore encourage you to find the latest copy yourself as it is unlikely I will be able to keep it up-to-date. Unless you have a HamPod, having just CW feedback available will no doubt limit the radio’s appeal to non CW operators. The CW feedback speed can be slowed to accommodate a beginner, but it can become laborious as the CW speed decreases. With the early firmware version on the test radio I could not find a method of interrupting the CW readout once it had started. For example, if I used the band up button to move from 40m to 15m, if I pressed the button quickly, I rapidly moved through 30m, 20m, 17m and onto 15m. The 15m frequency was then announced in CW. If I pressed the band up button slowly, I had to listen to the complete 30m frequency in CW, before further button presses worked. I found all announcements were not automatically interrupted by subsequent button presses, and I had to wait for the readout to finish before I could proceed. I was therefore very pleased to learn the lack of readout interruption on frequency changes has been addressed in later firmware releases, and this demonstrates the advantages of the rapid development cycle, and Elecraft’s continued attention to the accessibility issues. The readout duration may not be a problem if the CW announcement is set to a rapid 35 words per minute, but for slower speeds, the need to wait for the CW readout to complete was occasionally frustrating. The ‘C’ at the beginning of the announcement shows the Mode is CW. Note, only the Kilohertz are read back. Direct frequency input is possible, but with the limitation of only the Megahertz and Kilohertz being accepted. As there is no traditional keypad on the KX3, the buttons running along the bottom and the 3 knobs are used for inputting the numbers. This method works, but I found I could not quickly tap in a frequency without waiting for the CW announcement of each previous key press to finish. I understand there is some improvement to the interruption of playing CW readout, but to be totally certain of accurate input it is still prudent to wait until the completion of each number before pressing the next. In my experience, it is extremely useful for a blind operator to be able to enter an exact frequency. If the person you are in QSO with says they are moving up 750 Hertz, to get away from QRM, it is often easier and quicker to tap in the direct frequency, than to tune with the VFO, and then need to check you have made the correct adjustment by listening to the readout. I feel the limitation of not being able to read or enter the frequency more precisely than one Kilohertz, is a serious obstacle for a blind operator. I was pleased to find there was a Dual Watch feature, and both the Main and Sub receiver can be heard in separate ears. The Dual Watch operation is turned on and off from within the menu, and I believe this can be assigned to a Programmable button. There is a 15kHz tuning limit for the sub receiver, in Dual Watch mode, but it is unusual to have a wider spread for DX. 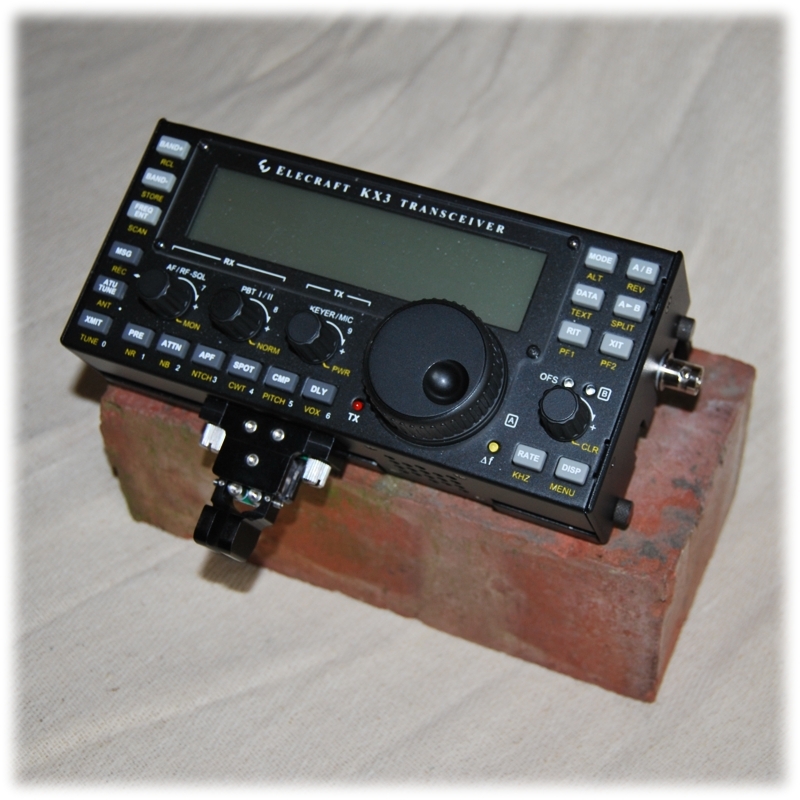 Rob K6DQ has been working on HamPod compatibility, using a KX3 loaned by Elecraft. Rob tells me ‘support for the KX3 is now equal to the K3.’. Rob had to add code for 26 additional menu screens, and the HamPod knows if it is connected to a K3 or a KX3, so it can process queries and commands accordingly. Rob also tells me existing HamPods can be upgraded with new firmware to include the KX3 support! I would encourage any blind operator to check Rob’s pages at http://www.hampod.com for the latest information. In summary, the KX3 is very accessible if you read CW, and will no doubt be improved. Congratulations to Elecraft for going the extra mile, and putting considerable effort into accessibility! I think it might be useful to readers to also mention the use of the radio with HDSDR. I fully expect things to get even better in regard to the KX3 accessibility. I just love mine! One thing I’ve done, just yesterday in fact, was to set up the programmable function keys to switch between hand key and paddles, and to switch various antenna tuner on/off, AGC on/off, and dual watch on/off in a five-way toggle. If you or any other KX3 users want the macros, let me know and I’m happy to share. fifteen or twenty. A bit fiddly though. All covered in the original owner’s manual. If the radio is powered up with the CWT button (Bottom row, button five counting from the left) pressed then the Morse user interface is activated at 20wpm. That is press and hold CWT then press the two power buttons (BAND and ATU TUNE simultaneously) then when the radio powers up release the power buttons first and finally release the CWT button. infrequently. This has happened to me once. The way to switch off Morse UI is through the SW Tone menu option. As far as I know you cannot select or deselect Morse UI using the KX3 Utility Program with the radio connected to a computer. The current firmware functionality is named “Morse User Interface (Phase 1)” and the documentation suggests that the later phase or phases will include Morse announcements on menu options as well as the button and rotary control operations already implemented. probably get in touch with Wayne at Elecraft if there are specific (And achievable!) ideas for future firmware. This review is being written in February 2013. At this time, I have been using the TS570D for over a year. I am not a power user, but I’ve used it enough in every-day operation to form a reasonable opinion of its pros and cons as a rig for blind operators, and it is from this perspective that I shall comment. My TS570D has been fitted with the optional VS3 voice chip. This chip has been superseded in more modern Kenwood models (such as the TS590) by the newer VGS1 chip. The VGS1 generally provides far superior speech access to visual information than the VS3 does. Nevertheless, the tactile nature of this rig’s controls, combined with auditory feedback in the form of bleeps and the spoken information provided by the VS3, mean that the TS570D can largely be operated by a blind op without too much difficulty. Having said this, some initial assistance in setting up the rig would be helpful, and may be invaluable if troubleshooting certain problems. This review is organised around a description of the rig’s main controls. In the course of describing its controls, I shall also explain how a blind op might best operate the rig, and describe the auditory and spoken feedback which is provided during operation. Here are my observations in more detail. The rig is fairly chunky, measuring approximately 273mm back to front (excluding the additional depth of front controls and rear sockets), 285mm side to side, and 105mm top to bottom. The rig has a flip out metal stand which runs across the width of the rig, just underneath and slightly back from the front edge. This helps to slightly elevate the front of the rig and place its controls at a more ergonomic angle. All the controls on this rig are on the front panel. The controls comprise a combination of tactile rubber buttons of different shapes and sizes, and plastic rotary dials. The controls are arranged into different zones, or groups. Although there are a lot of buttons and dials on this rig, they are sensibly organised and are relatively straight forward to distinguish by touch. Towards the top left corner of the front panel is a cluster of eight buttons in two columns of four buttons. The top left most of these is a small round PF (programmable function) button. This can be programmed to perform one of a range of functions. I have programmed this button on my rig to speak the RX signal strength via the VS3 voice chip. (This is achieved by changing menu 41 from a value of 51 to 52.) The remaining seven buttons in this cluster are all rectangular in shape. The first of these is the power button. This is located immediately to the right of the small round PF button, and it has a series of raised dots along its surface which make it easy to find. The remaining six buttons in this cluster are as follows: buttons to activate VOX and send/receive, buttons to activate attenuation, pre-amp and processor, and a button to activate and tune the internal ATU. There is bleep feedback when these six functions are toggled on and off, the pitch of which is slightly higher when the relevant function is activated and slightly lower when it is deactivated. However, this difference in pitch is quite slight and so may be hard to detect reliably. The ATU button is the one located at the bottom right of the group of eight buttons. Pressing the ATU button in and then quickly releasing it will toggle between turning the ATU on and off. You will want the ATU on unless you are intending to use an external ATU, in which case you will want it off; you should be able to tell whether it is on or off by the pitch of the bleep made when the button is pressed. With the ATU on, pressing and holding the ATU button in for a second or so will cause the internal ATU to look for a match. Whilst doing so, the ATU provides good auditory feedback through the sound made by the latching of the relays. If a match is found, there is a single beep. If a match is not made, then a longer sequence of CW characters is played. I do not know CW, but I understand from other blind ops that the CW spells out “SWR”. In any case, even if you do not know CW, the sequence of bleeps produced when no match is found is noticeably longer than the bleep produced when it makes a match. Immediately to the right of this group of eight buttons, and stretching most of the way along the top of the control panel, is a smooth plastic area. This is the LCD display. Below this group of eight buttons is a 6mm headphone socket, and below this is a standard Kenwood mic socket. To the right of these two sockets, and below the LCD display, is the numeric key pad made up of twelve round rubber buttons. These have a slightly convex shape. They are organised like a telephone key pad in three columns of four, with the 1 key in the top left, and the 0 key bottom middle. There are four small raised dots on the 5 key making this easy to locate. The bottom left button is Clear, and the bottom right button is the Enter key. Direct frequency input is very easy: simply press the enter key, enter the desired frequency (omitting the decimal point), and then press enter again. All key entries are spoken, including “enter” when the Enter key is pressed. The new frequency is also spoken after the second press of the Enter key. Pressing the Enter key twice in succession will cause the VS3 chip to speak the current frequency, which is very handy. Most of the buttons in the numeric key pad perform secondary functions which are activated if they are selected without the Enter key having been pressed first. For example: the 4 key toggles the TX and RX between Antenna 1 and Antenna 2 sockets; the 6 key modifies the operation of the VFO control so that one rotation of the VFO is either 1kHz or 10kHz; and the 7 key toggles the Noise Blanker on and off. Unfortunately, the VS3 chip does not speak the status of these functions, and whilst these keys do issue a bleep when pressed, there is no difference in the pitch of the tone of the bleep to indicate whether a function is in one state or another, so it may not always be easy for a blind operator to determine this. However, with some trial and error, and use of lateral thinking, this can often be overcome. For instance, it will be obvious when toggling between Antenna 1 and 2 which you are on if you only have one antenna connected, or if you have two, if you disconnect one of them. Using frequency read out by pressing Enter twice will tell you whether your VFO is moving in 1kHz or 10kHz steps if you check the frequency before and after a single rotation of the VFO tuning dial. These days, One can even use on-line software defined radios accessed through websites to listen to one’s transmissions to try and determine the setting of other TX related functions. Moving on, there is a further column of four round buttons to the right of the numeric buttons. These are smaller in size than the numeric buttons, but also have a convex shape. They are the transmit functions which are used in conjunction with the Multi Channel selector dial found towards the bottom right of the rig. From top to bottom, these buttons are: Mic, to set the microphone gain; Power, to set the TX power; Key, to set the internal keyer speed; and Delay, to adjust the delay between TX and RX when VOX is activated. These buttons produce a high tone when activated and a low tone when deactivated. So, for example, to adjust the TX power, you press the second button down once, then use the Multi Channel selector knob to set the desired power level, then press the Power button again to store the change. The Power button produces a high pitch bleep when the power setting function is activated, and it issues a lower pitch bleep when storing / deactivating the function. The difference in pitch is significant and so will be easy for most people to detect. Unfortunately, the VS3 does not voice the power level (nor any of the other values which can be altered with these four buttons such as the microphone gain level). Nevertheless, it is possible to set power accurately, since the lowest power setting in the range is 5 Watts, the highest level in the range is 100 Watts, and the incremental change is always 5 Watts. So, to set power to 50 Watts, press the Power button once and listen for the high pitched bleep. Then turn the multi channel selector anti-clockwise at least 20 clicks. This brings the power level down to the minimum of 5 Watts. Then turn the Multi Channel selector nine clicks clockwise, which increases the power to 50 Watts. Finally, press the Power button again and listen for the low pitch bleep to confirm that the new power setting has been saved. The main control to the right of this column of four buttons, is a large VFO tuning dial. It is easy to grip as it has a ridged and rubberised outer surface. On the front face of the VFO tuning dial, there is also a finger indentation. A torque switch is located at six o’clock directly underneath the tuning dial which, when slid to the left provides a light touch movement to the dial. When slit to the right, it provides greater friction in the movement of the VFO dial making it easier to move the VFO in very small increments. I like to have the VFO set to tune by 10 kHz per rotation, but this is adjustable as already indicated by pressing the 6 key which will reduce it to 1 kHz per rotation. To the left of the VFO tuning dial and hugging the curve are a further three round buttons. These are slightly larger than the numeric buttons, but have a concave shape. These are the mode selectors, and from top to bottom they are: LSB/USB selector; CW/FSK selector; and FM/AM selector. When pressed, the VS3 chip announces the selected function in CW bleeps. This is not very helpful if, like me, you don’t know CW. However, I have learned to recognise the difference between LSB and USB because the CW bleeps for LSB are noticeably longer than the CW for USB (note that both “LSB” and “longer” start with the letter l, which is how I recall it). Below these three buttons and still to the left of the VFO tuning dial are two very small round buttons (though I understand that on some versions of the TS570D these may be rectangular in shape). When pressed, they bleep, but there is no difference in the pitch to indicate what state they are in. This should not present any difficulties though, as we will see. The right hand of these two buttons is the 1MHz / Amateur Band mode button. This button toggles the function of the Down and Up buttons between 1MHz and Amateur Band modes – I shall mention this again later. The left hand of these two buttons is the Menu button. When pressed, the Menu button toggles the menu system on and off. Blind ops considering the TS570D will be pleased to know that the menu system is accessible via spoken prompts from the VS3 voice chip. To activate the menu system, press the Menu button once. There will be a single bleep and the VS3 chip will announce the menu number, eg, “menu eleven”, and the state of the setting associated with that menu, eg, “on” or “off”. Once the menu system is activated, you use the Multi Channel selector dial to move up and down through the different menus, and each menu is announced by reference to its number. This means that one needs a separate list detailing what each of the numbered menus are in order to make sense of the spoken information. In order to change the setting associated with any given menu, one uses the Down and Up buttons, either on the rig itself, or on the supplied Kenwood microphone. I will discuss the Down and Up buttons on the rig shortly, but on the microphone, they are located on its top surface. The options within a menu do not wrap, so when the last option is reached at the start or end of a menu, further presses of the relevant Down or Up buttons will only elicit a bleep. Each time a menu setting is changed in response to a press of the Down / Up button, the new setting is announced, eg “on” or “off”. Again, one must refer to an external list detailing what the various settings associated with each menu are in order to make sense of this information. Once all changes are made, press the Menu button again, a short bleep is heard and the menu system is deactivated. Thankfully, a list describing the numbered menus and their settings is provided in the manual, a recording of which is available on the Active Elements and RAIBC websites. Moving to the right of the VFO tuning dial, there are four further groups of buttons. With the exception of the first and last of these, these are generally used for more advanced operation such as working split frequencies, and, not being a power user, I am less familiar with their operation. So my tour of this part of the rig will be less detailed. The first is a row of four round, convex shaped buttons, located immediately below the LCD display. Working from left to right, these are as follows: the Down button; the Up button; the Quick Memory Recall button; and the Quick Memory In button. The Down and Up buttons have a minus and plus sign, respectively, inscribed into their surface. Someone with sensitive touch may be able to make this out. These buttons perform three functions. As already seen, when the menu system is activated, they move down and up through the available settings within the selected menu. Otherwise, there other two functions involve moving the frequency of the currently active VFO: when the rig is in 1MHz mode, they move the frequency by exactly 1MHz; when Amateur Band mode is active, they move the frequency from one amateur band to the next. The Quick Memory buttons provide a quick way of writing, and then recalling, operating settings into quick memory. There are five quick memory positions. Each time new settings are added to quick memory, the oldest entry drops out of memory and the remaining four entries are shuffled along one place to make way for the new entry, which is added into the number 1 memory position. Data that can be entered into and recalled from Quick Memory includes frequency and mode, as well as other settings. To add a frequency and its associated settings into quick memory, simply press the Quick Memory In button. This button has a tactile dot on its surface. It will bleep to confirm. To recall a frequency and its associated settings from quick memory, press Quick Memory Recall. There will be a bleep, and the VS3 will speak the number of the currently selected memory position, followed by the frequency stored there (it will not speak any of the other settings such as mode). Use the Multi Channel selector knob to click up an down through the five available quick memories. As you do this, the VS3 will speak the memory position and the frequency stored there, and the VFO will jump to that frequency so that the RX can be heard. At this point, a user has two choices. You can either exit quick memory and return to your previous frequency and settings by pressing Quick Memory Recall again. Alternatively, you can choose to exit quick memory and return to normal operation using the settings stored in the selected quick memory position. To do the latter, you need to press the N>VFO button (discussed below) instead of the Quick Memory Recall button. Pressing the N>VFO button causes the contents of the selected quick memory to be copied to the VFO and puts you there whilst also exiting quick memory. In either case, there will be a bleep to confirm. The next group of buttons is below the row containing the Down/Up and Quick Memory buttons. This group is arranged in two rows of four round buttons. The buttons themselves are slightly larger, and are concave in shape. These buttons largely relate to split operation, which is not an area I have explored in any detail. I shall therefore skip over this section. However, I understand from other blind ops that it is possible to operate this rig in split mode, if that is something you are interested in doing. The next group is a row of three rectangular shaped buttons immediately below the buttons used for split operation. From left to right these are the Scan button; the N>VFO button; and the Memory In button. The N>VFO button is used, as mentioned above, to copy the contents of a quick memory to the VFO. The last group of buttons is a column of four rectangular shaped buttons immediately to the right of the LCD display. The top button is a Noise Reduction filter which toggles between three settings: off, and two filters referred to as NR1, and NR2. The next button down is a DSP beat cancellation filter which toggles between on and off. It is usually obvious from the RX audio whether these filters are activated. The next button down activates the CW zero beat function. The bottom button enables the RX bandwidth to be changed if an optional filter chip is installed, which it is not in my rig. The remaining five controls on this rig are smallish plastic rotary control dials which are all easy to locate and use. The first two are located below the column of four buttons which I have just mentioned. The top one is the RIT / XIT dial which is used for split operation. The bottom dial, which is located at the bottom of the front panel, is the Multi Channel selector dial. This clicks as it turns. This makes the selection of frequency (when in VFO mode), menus (when the menu system is activated), and quick memories (when Quick Memory mode is activated) straight forward. Using menus 4 and 5 in the menu system, the Multi Channel dial can be set so that, when changing frequency in VFO mode, it does so in steps of 1kHz, and to the round frequency, for every click of the dial; this is a very useful setting to bear in mind. At the extreme right hand edge of the control panel are three further dials which effect the RX audio. They are all designed with an inner and an outer dial which move independently of each other. The top dial is a DSP sloping pass band used to cut out high / low frequency noise. The middle dial is the RF gain and the audio volume. The bottom dial is the squelch, and the IF band pass control which enables you to slightly adjust the RX band pass higher or lower when interference is present. These are all perfectly usable by a blind op as their effect is obvious from the RX audio. With the exception of the headphone and microphone sockets, all other sockets are located on the rear of the unit. I shall not discuss these as they are amply described in the manual, a recording of which is available on the Active Elements and RAIBC websites. Three final observations will complete this accessibility evaluation of the TS570D. First, just to make clear that whilst the VS3 provides spoken access to certain information such as the current frequency, the frequency in quick memories, and the menu system, it does not speak the status of other settings such as mode (although these are indicated using CW tones), filters, and other TX and RX settings. Secondly, it is worth knowing that the TS570D retains the status of certain settings within each amateur band allocation. Settings being used for each band are stored independently of the settings being used in other bands. The settings that are stored are those which are set when the VFO moves in and out of the band, whether this occurs via direct frequency input, by turning either the VFO tuning or Multi Channel dials, or by moving via the Down and Up buttons. Therefore, if you adjust a setting, such as switching from LSB to AM, this will be retained when you return back to the band. This is the case even if you have powered off the unit and then powered back on. This clearly has advantages, but it can be a little annoying if a setting is changed inadvertently as it may take some time to realise that you have made a change and what that change is. I would suggest, therefore, adopting a fairly strict routine of trying to ensure that all settings are returned to an expected state before switching bands or powering off, in order to avoid unexpected surprises when that band is revisited, or the rig is switched on next time. Third, whilst it is adequate, the sound quality from the internal speaker is not as good as you may wish, and therefore a separate speaker may be desirable. One of the nice things about the audio on this rig, especially when using an external speaker with an independent volume control, is that you are able to independently control the volume of the RX audio and the information spoken by the VS3 chip. The AF dial on the rig itself can be used to control the RX audio, but this does not change the volume of the VS3 announcements; to do this, you can use the separate volume control on your external speaker. When working with the internal speaker, or on headphones, the VS3 volume is set to a specific level which can not be altered, but I find that it is set to a perfectly acceptable level for my normal hearing.